Sorry for the radio silence folks but we've been away in Japan living it up and the re-entry to "real life" has been a bit tough. Both Dave + I got REALLY sick with a tummy bug when we got home, I've done something to my shoulder, work is bonkers and my sewjo has totally up and left the building. All of that aside we had a GREAT time in Japan and are booked already to go back in December. 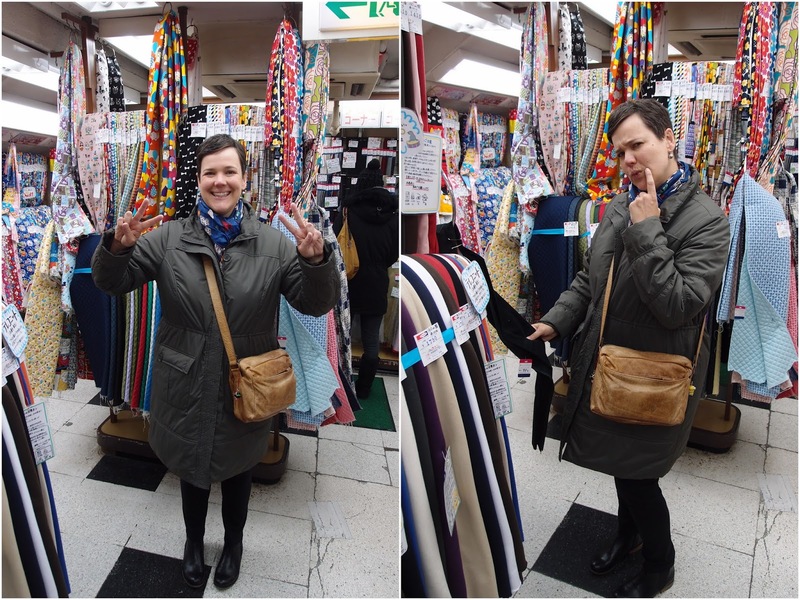 Whilst my sewjo departed before my holiday (due to a massive f**k up sewing some VERY expensive Tessuti fabric that I can't bring myself to blog about) I did want to do a small amount of fabric shopping in Japan. I had NO idea that the ATELIER to naniIRO was in Osaka until someone told me via Instagram - the things you learn on the internet! 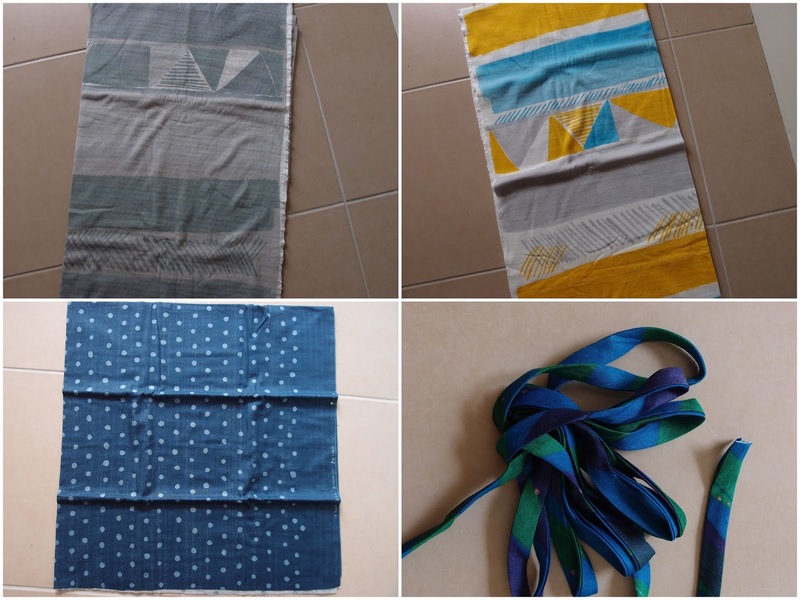 naniIRO has A LOT of fans out there and I do love the colourful fabrics she produces but I've never opened up my wallet before to make a purchase as it's not exactly cheap...and I'm not sure what I'd sew with this fabric. Also, naniIRO seems to be all wovens (and you know how I feel about them) so I was just going to have a look at the Atelier, for curiosity sakes, and then move along. You can't take photos inside naniIRO...no idea why, but them's the rules, so here is me outside with my haul! The atelier isn't too hard to find as I found this VERY useful blog post with great directions. The shop is really cute - looks like it's straight out of Frankie magazine. The staff, who look just like the girls out of a Japanese sewing book, speak a little English so that was very helpful.The whole place is very quite as the staff go about cutting up fabric for online orders. I loved it. Dave was bored out of his socks. After a quick look around I was about to walk out empty handed - everything was beautiful, but I wasn't sure what I'd make with any of it. Before we headed out the door I thought I'd go for a peak in a tiny room off the main room called the "naniIRO museum". In there were little precut pieces for sale; as well as swatch books of fabric from past collections...complete with a swatch book of knits. BINGO! I wasn't sure if the fabric in the swatch book was for sale or not...but lucky for me it is! There were only about 15 knit swatches in the book but it took me about 30 minutes to decide on what to buy (poor Dave)! In the end I went for a lovely blue-grey pattern that I thought would make a nice Mandy Boat Tee. Because I came to Japan without much spending money (!) Dave took pity on me (also it was my birthday) and bought me a lovely colourful piece that he took a liking to. At the last minute I grabbed a piece of polka-dot cotton that I thought I could make a zipper pouch out of (now I'm freaking out about sewing a zipper) and some bias binding...as I love bias binding. The fabric is quite a bit cheaper here than in Australia...I paid about AUD$80 for 3 meters of knit fabric, the cotton and the bias binding. The fabric is VERY narrow, only 80cm, which is why I bought so much. I'm too scared to use any of this beautiful fabric though...I've ruined too much fabric in the last 18 months so all of this is going into the stash cupboard until I get my confidence back.